"When the 'sholders' are 'warring' and they come home and are hurt, the quilt makes them feel all comfy." This is not about politics. It's about people. 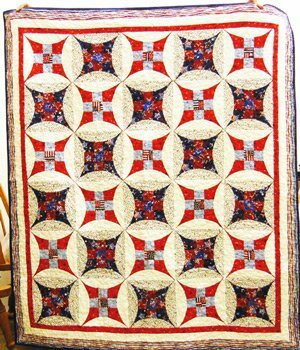 In 2015, The Fabric Chicks Quilts for Soldiers ladies have donated 125+ quilts. In 2016 we donated over 130. Once a month our volunteers meet to work on putting together kits to then take home and finish. If you are interested in participating in this program, please contact our store. We will provide you with a kit, or you can create and donate your quilt. 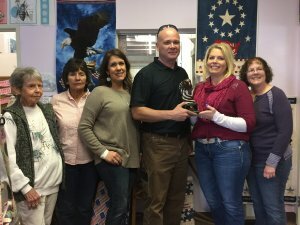 Recently we were honored to receive an award as thank you for all our effort.